EDISON, NEW JERSEY (May 10, 2017) – The compact and efficiently designed Sanimarin MAXLITE system from SFA Saniflo flexibly replaces manual hand pump toilets on all types of boats, integrating a macerating pump, an electronically activated toilet and a seawater pump into one single package. MAXLITE’s lightweight, plastic design simplifies installation while minimizing the strain on the boat. The bowl can be variably positioned, allowing it to fit in very tight spaces, an indispensable quality when it comes to smaller vessels. Inside, the integrated, self-priming seawater pump eliminates the need to invest in a separate pressurized water supply system and, in fact, cannot be connected to such a system. Powerful stainless steel macerating blades quietly grind waste to slurry before discharging it out of the system. The system can consume minimal water and electricity and, therefore, has the same environmental footprint as manual toilets without the need for strenuous hand pumping. Soft-close toilet seats add style and comfort. A two-position rocker switch allows the user to command the unit to either add water or pump out waste. As a result, the user has full control over how much water the system consumes. When “Pump Out” is activated, waste is flushed from the bowl into the macerating area below. This area contains both a pump and a macerator. The latter is a turbine with stainless steel blades that swiftly grinds the waste matter into fine particles in three to six seconds. The waste matter is simultaneously pumped through a standard 1- or 1-1/2-inch plastic pipe into a blackwater holding tank, which may be located above or below sea level, for eventual discharge. 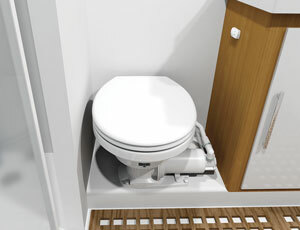 Thanks to their 10-foot pumping height and powerful horizontal pumping distance of 100 feet, MAXLITE toilets enable boat owners to locate the blackwater tank (or purification system) wherever desired on board. Once the toilet bowl is completely emptied, pressing the “Add Water” switch will refill the trap using the seawater pump. The water level in the bowl adjusts automatically at the end of each flush cycle to eliminate all risk of odors. Sanimarin MAXLITE has an MSRP of $630. To order online, please visit sanimarin.com. Horizontal pumping distance: 100 ft.
SFA SANIFLO U.S.A. – whose parent company originated macerating plumbing technology — offers a complete line of waste and drainage pumping systems for residential and commercial applications. Saniflo developed its innovative, “above-floor plumbing” technology nearly 60 years ago and has led its commercialization worldwide. Today, the company markets macerating technology through 24 subsidiaries in 50 countries and has sold more than seven million units worldwide since 1958. Saniflo markets through independent sales agents throughout North America, and the product line is currently available at distributor and dealer locations throughout the United States and Canada. 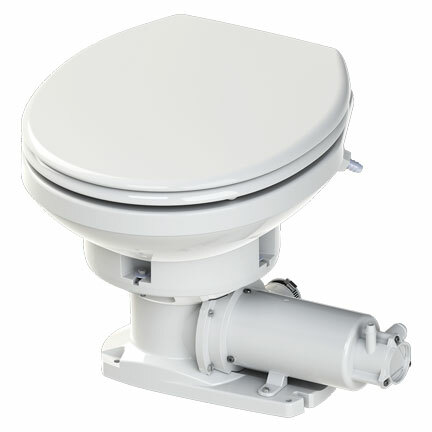 The compact, lightweight Sanimarin MAXLITE integrates a macerating pump, electronically activated toilet and seawater pump. The Sanimarin MAXLITE consumes minimal water and electricity and, therefore, has the same environmental footprint as manual toilets without the need for strenuous hand pumping.